Belize Whale Shark Diving at Gladden Spit, the Belize Barrier Reef, Great Value with our Accommodation and Scuba Diving Packages, in Placencia. Splash Dive Center can customize your stay with a variety of accommodation providers in the beautiful village of Placencia or near Hopkins during your stay in Southern Belize on one of our Belize Gladden Spit Whale Shark diving packages. Gladden Spit is famous for the majestic whale sharks that come at certain times of the year to feed and Splash Dive Center can offer you a high probability encounter with these creatures. You can read more on this page about our Whale shark dives and also here about the famous Gladden Spit near Placencia in Southern Belize. These packages are a resort divers delight, and for accompanying non-divers we can offer Whale shark snorkeling trips as well. Splash Dive Center ‘Belize Whale Shark’ packages offer the highest probability of Whale Shark diving at Gladden Spit, Belize. 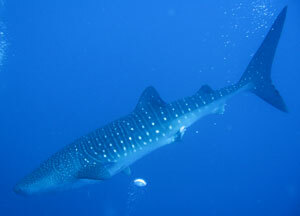 The best months for whale shark diving are April and May. Please note the encounter success rate is lower in March than in other months so we do not pre-book guests for whale shark diving for the March whale shark moon. We monitor the whale shark zone in March and if whale sharks are there and divers want to go, we will take them. Scuba equipment is not included but is available for rent. Contact us for specific information and to arrange a reservation.